Easy Living Furniture is made of fully UV-Stabalized Polyethylene plastics with 3/16" wall thickness to last a life time. 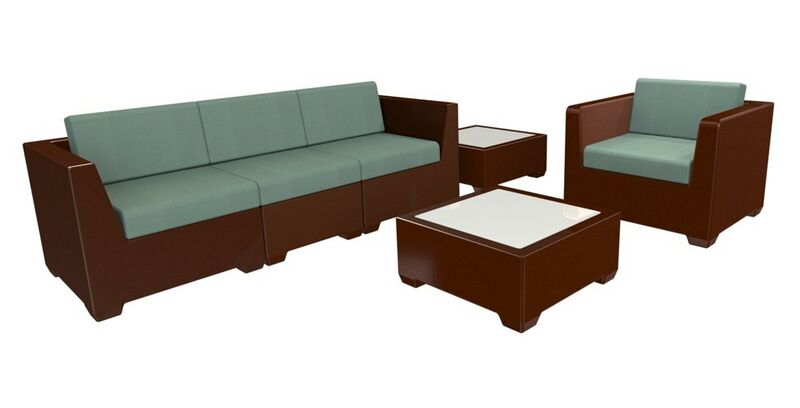 Rotationally molded makes the furniture stronger at the corners than most other types of outdoor furniture. Frames are made with molded in color that won't fade or chip because the plastic is pigmented thoughout. The frames polyethylene construction and smooth finish makes cleaning a breeze with any cleaner. Our cushions are 6" thick and made from a firm Fiber fill that gives lots of support. The fabrics we use are UV and fade resistant made from yard-dyed Polyolefin to insure long lasting durability. The modular contemporary design of the furniture allows for unlimited Seating arrangements.